In 1992, I created a treasure hunt for my girlfriend Keke. I set the whole thing up before I left Santa Barbara for the summer. I found various locations around town that could serve as clues, leading her to a final map pointing the way to buried treasure! I had found various references to certain playing cards around Isla Vista and Santa Barbara. The cards in a special "Pirate's Card deck" had to be delt out to indicate the location of the final map. I used the Queen of Hearts logo at the Game Keeper store on state street for one card, and the 2 spades on Ray Bradbury's Tasset on the Earthling Books Mural for another. I was amazed at how often these images were showing up around town. I wanted at least one clue in the popular intersection of Hollister and Fairview. 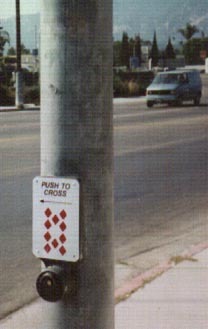 While on a scouting mission, I noticed that one of the light poles was missing it's pedestrian "push to cross" sign placard. I took note of the bolt hole size (Metric!) and made a crude pattern for a new placard. I cut a suitable square out of steel and carefully rounded the corners. I could not hope to duplicate the reflective paint they usually have, so I just used white. I used a paper stencil to make a classic card pattern. It represented the ten of diamonds. It came out very well. The panel mounted with a minimum of difficulty in broad daylight. I really expected this panel to last a very long time. It stayed for a while, long enough for Keke to see and complete the treasure hunt, but it was replaced before I returned at the end of summer. I guess it wasn't good enough to instruct people on the correct pushing procedure for crossing. The treasure that she dug up at the end was a copy of Angry Women from REsearch publications.